Last weekend, with glorious fall weather, my son, Ben; grandson, Leo; visiting friend, Donna, and hired man, Juan, gathered to help me pick the olive crop. 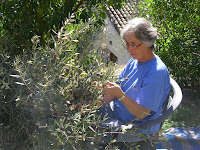 Donna and I had already filled one gunny sack with pickings from several small trees, but that day we gathered the olives from a single big tree. 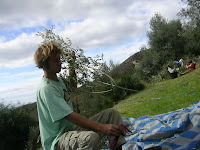 With a tarp spread on the ground to catch fallen olives, Ben clambered up the tree to cut down high branches with a chain saw. The tree badly needed pruning anyway and it’s way easier to hand-pick the olives once the limbs are on the ground. 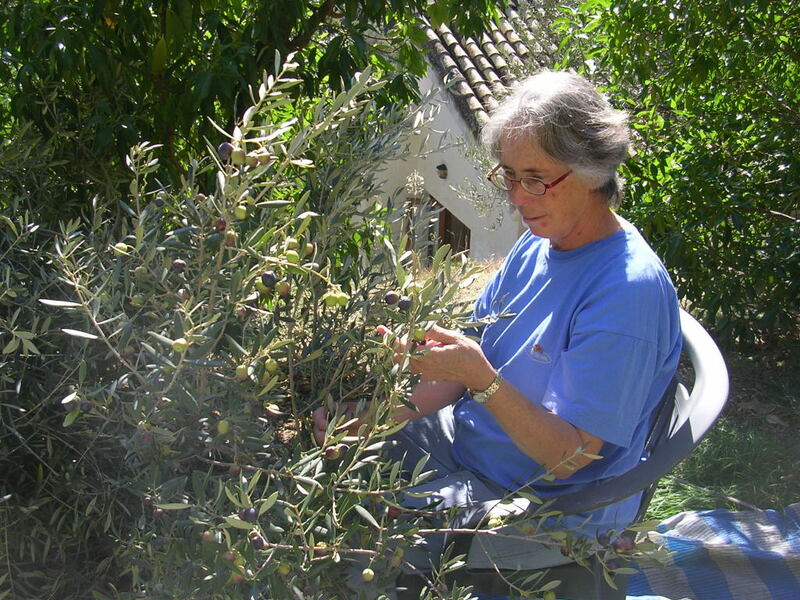 Donna could sit on a chair, “milking” (ordeñar) the olives right into a bucket. I picked from limbs within reach—great stretching exercise! Leo, six, rolled olives on the tarp into a bucket, then happily used twigs to make fantastical play creatures. 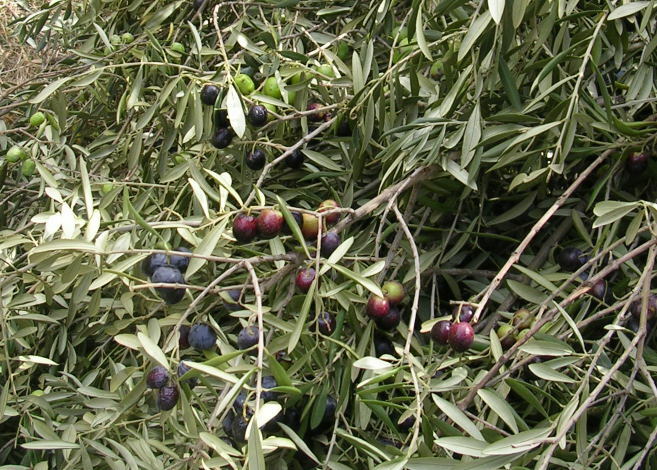 Olives on remaining high branches were brought down by vareo, thrashing the branches with a cane pole (cane grows wild in the arroyo, free for the picking) and rastrilla, raking through branches to drop olives onto the tarp. Later, limbs will be cut up and stacked for next year’s firewood. We loaded four big sacks of olives into the trunk of my car, the fruits of two-days picking. On Monday I drove to the almazara, oil mill, in a nearby town. Picking olives together on a sunny day with family and friends was actually fun. However, it's not easy work. I’m glad my livelihood doesn’t depend on it! I still have several trees to be picked. Maybe when Ben and Leo come for a visit over Christmas holidays. I made an olive pickers’ stew to feed my crew. 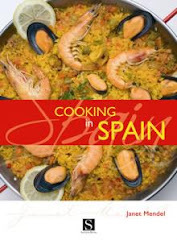 This recipe is taken from my book COOKING FROM THE HEART OF SPAIN—FOOD OF LA MANCHA. 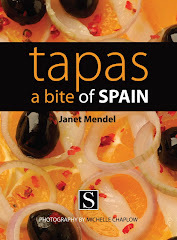 The stew comes from the Montes de Toledo, an area famous for its olive oil. 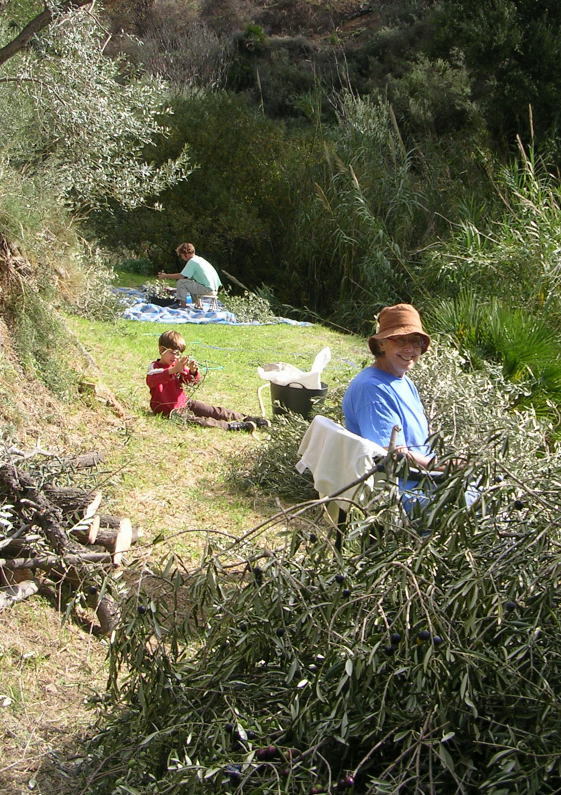 Groups of pickers work all day in the olive groves. They make a roaring fire, to warm the hands and cook the midday meal. 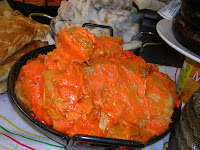 The traditional version is made with bacalao, dry salt cod that has been soaked for 24 hours to de-salt it. 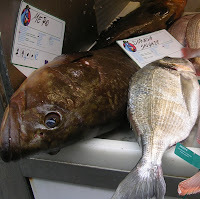 In this recipe I have used fresh cod, which needs only minutes to cook. 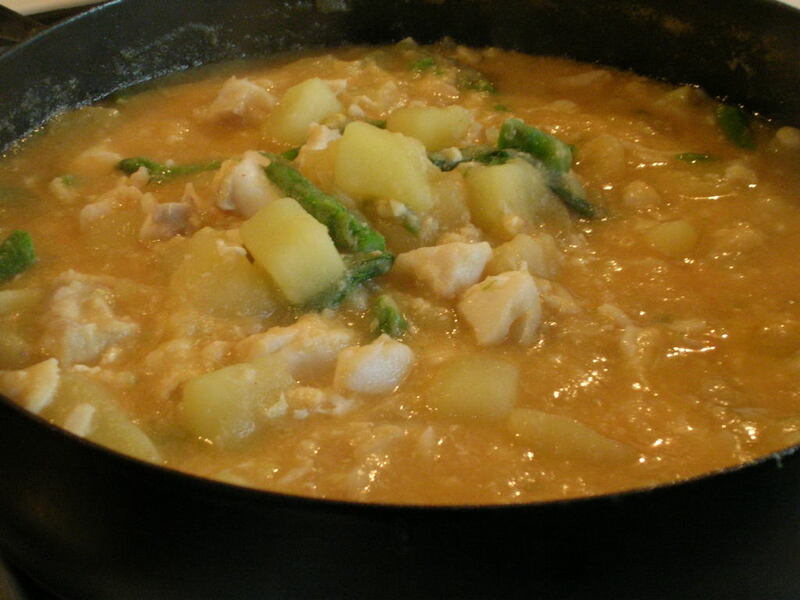 If you use salt cod, cook it very gently with the potatoes. I like the addition of something green—in this case asparagus. Sprinkle the cod with salt and let stand at room temperature. Place the potatoes in a soup pot or deep skillet with the oil and sauté 2 minutes. Tuck the bay leaf and chile into the potatoes and add 2 teaspoons salt and 2 cups water. Bring to a boil. Cut a small slit in one, unpeeled, clove of garlic and add it to the potatoes with tomato and onion. 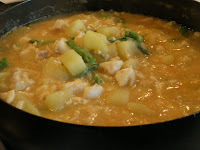 Cover and simmer the potatoes until almost tender, 15 to 20 minutes. Remove and discard bay leaf and chile. Skim out the clove of garlic and tomato. Remove skin from cooked garlic and tomato and place them in a blender with 1 clove peeled raw garlic, cumin, sweet pimentón, hot pimentón, and ½ cup of liquid from the potatoes. Blend until smooth. Add this sauce to the potatoes and cook 5 minutes. Add the cod to the pot and cook until it just flakes, about 3 minutes. Stir in the asparagus, if using. Raise the heat so the liquid bubbles. Break the egg into the pot. Use a fork to stir it into the cod and potatoes, about 1 minute. Remove from heat and allow the stew to rest 5 minutes. Serve in shallow soup bowls. To market, to market, to buy a fat pig. Or small goat. A grand grouper or a heap of spiny sea snails. One sunny Saturday a friend and I hopped on a commuter train for the 50-minute ride to Málaga to visit the recently reopened Atarazanas market and have lunch at La Moraga a “gastrobar” that’s been getting a lot of attention since it opened two years ago. We entered the market through a grand marble arch, all that remains of a naval fortress from the 14th century when Málaga was under the Islamic rule of Moorish tribes. The fortress, known as Atarazanas, gradually fell into ruin and was demolished to make room for a municipal market. Opened in 1879, the market was built of iron struts, somewhat in the style of Les Halles in Paris. It shut its doors two years ago (stall holders moved to provisional locations) for complete remodelling and reopened to the public only a few months ago. Many years ago, when the variety of produce and food products was very limited in the small Andalusian village where I live, I trekked to Málaga to shop every couple months. 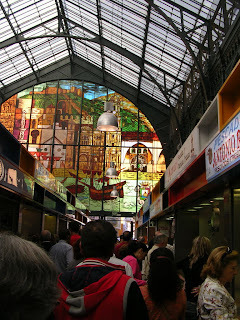 Now, with big hyper-markets near my home, I had not been to Málaga market in many years. 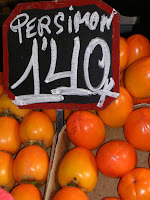 It was a delight to see the great variety of local foods. 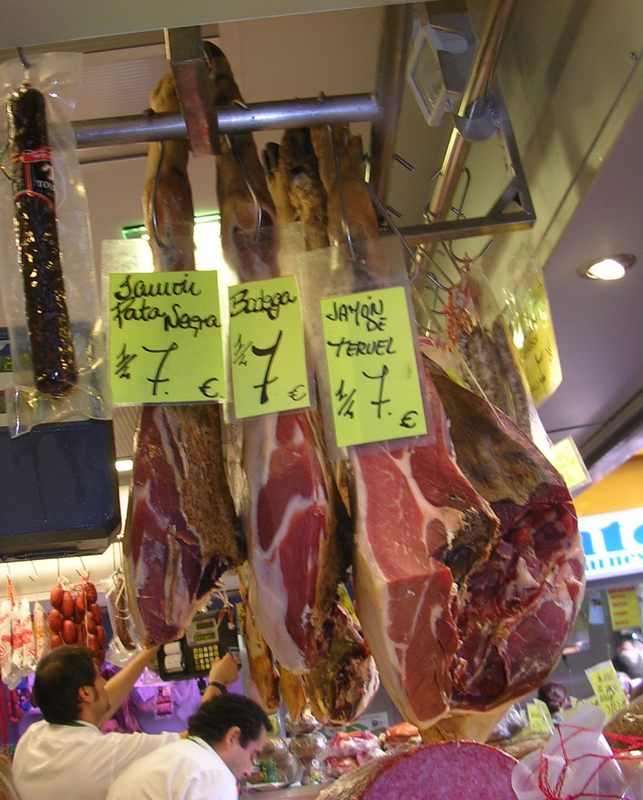 All the parts of a pig—snout to tail, fat and lean, fresh and cured—were on display at market stalls. Blobs of white fatback hung from meathooks and coils of skin for making cracklings were piled on counters. 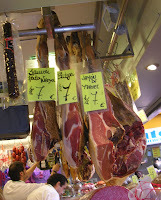 At the delicatessen stall were several sorts of cured hams, both ibérico and serrano, as well as manteca colorá, paprika-flavored lard, the Andalusian alternative spread to butter. 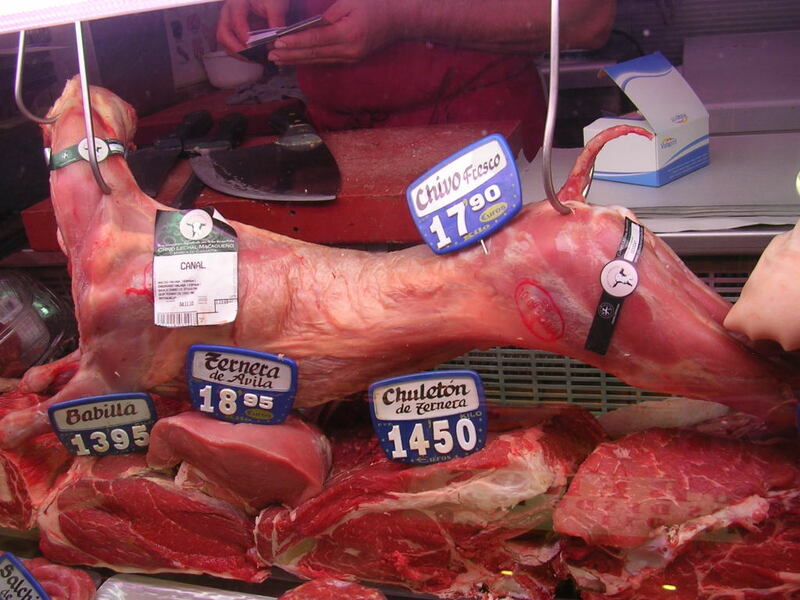 Málaga is famous for its chivo, small kid-goat, as esteemed as baby lamb and just as expensive. 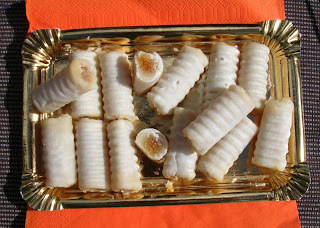 It is the meat of choice for Malagueños for the family feast on Christmas Eve.The province is also known for goat cheeses, from the fresh, white ones to crumbly aged ones. 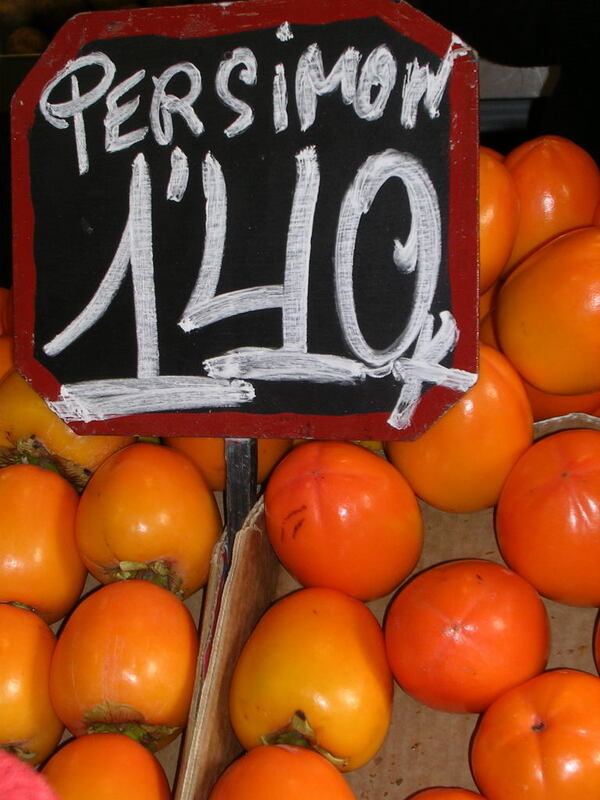 The market is the right place to find a good selection of them. 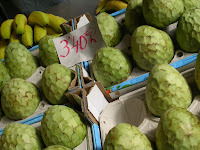 Produce stalls were heaped with seasonal fruits—persimmons, quinces, custard apples, as well as the more usual apples and pears. Wild mushrooms shared pride of place with fresh chiles. 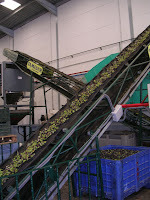 Jugs of new olive oil were displayed on many counters and tubs of new-harvest tangy, thyme-scented olives were lined up on others. 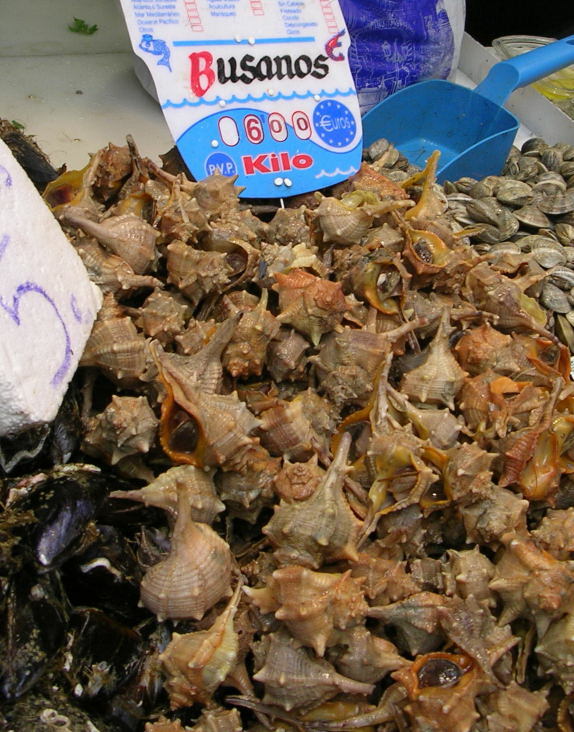 Málaga is a famed fishing port, so the market reflects the seafood riches, from the sublime—whole grouper, jumbo shrimp—to the curious—armored fish, spiny sea snails, fatty livers from monkfish (considered a delicacy like foie gras). At 2 pm on a Saturday, the place was packed with Malagueños, mostly young, some with kids in tow. 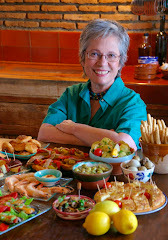 Most belly up to the bar to select from a varied tapas list. We decided on a tasting menu (menu de degustación) and claimed a small table off the bar. For €20 (about $27) each we selected four different tapas. We sampled a pair of gazpachos—cherry with a powdering of queso fresco, and peach, with tiny cubes of tofu. 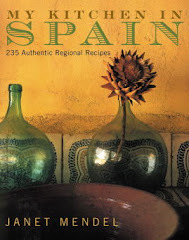 Olive oil, Sherry vinegar and a hint of garlic brought them all back into Andalusian focus. Next came a brace of ensaladilla rusa, “Russian” salad, a tapa bar standard. One was almost classic—smashed potatoes, olive oil mayo, and tuna belly. The other was bound with a smoked salmon mayonnaise, dill and sprinkled with salmon caviar. Quite delicious. Two croquettes each, crisp balls with hammy-fatty meat (pringá) in one and sausage in the other. 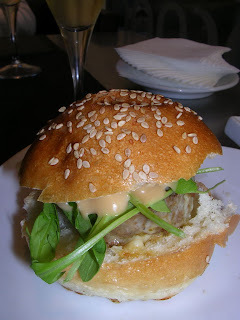 Then a cazuelita of pork cheeks stewed with spicy garbanzos and the house signature dish, bull burger, a patty of oxtail cooked sous vide until meltingly tender, heaped on a mini-bun and served with mushroom-mayo. With a couple glasses of cava to celebrate a birthday, this was a very nice Saturday lunch. Trick or treat is just starting to catch on in Spanish towns and lately jack-o-lanterns and witches’ on broomsticks are popular novelty items. Instead of Halloween, in Spain there are two holidays in a row—November 1 is Todos los Santos, All Saints—a real holiday when businesses and schools are closed. November 2 is Día de los Difuntos, Day of the Dead. Once village folk believed that spirits roamed on that night, so the faithful kept a night-long vigil in the cemetery. Now it’s an occasion for honoring the dear departeds with visits to cemeteries. 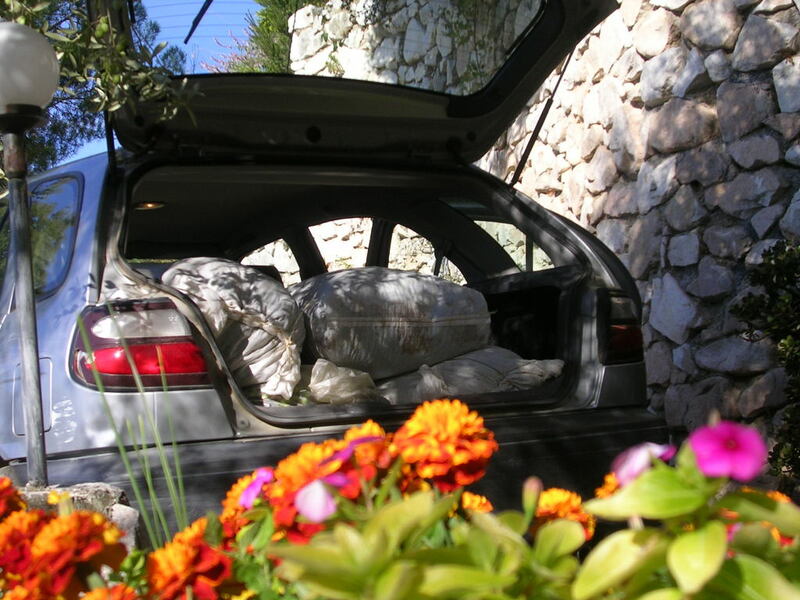 Flower sales soar on these two days. And, while I don’t have any statistics, I bet more roasted chestnuts are sold on these chilly evenings than on any other night. Also traditional for these autumnal holidays are batatas asadas, roasted sweet potatoes; buñuelos, fried crullers or doughnuts; rosquillas, anise-flavored buns; arrope, a sweet made of boiled grape must; panellets, pine-nut studded almond sweet, and huesos del santo, saints’ “bones”. The bones are confected of sweet almond marzipan, filled with a sweetened cream of egg yolk, sweet potatoes or chocolate, and coated with a white sugar glaze. Unlike some of Mexico’s Day of the Dead breads, these really look nothing like bones! 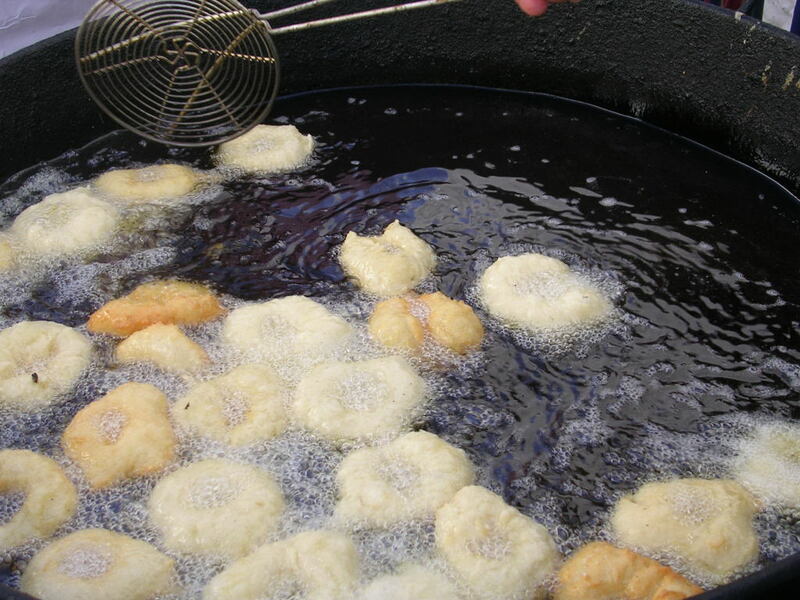 Buñuelos are street food. Neighbors get together to prepare the batter, a yeast dough, shape and fry the doughnuts. María Jesus and Remedios paired up to make the buñuelos. The batter was made with bread starter dough from a village bakery, flour and water. After fermenting for five hours, it was ready to go. 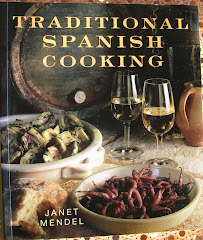 They filled a deep cauldron with olive oil—best, said María Jesus, because it can be reused once or twice—and heated it with a lemon wedge. When the lemon is blackened, you know the oil is hot enough. 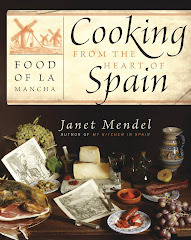 María Jesus shaped the buñuelos, patting the stretchy dough into patties, putting a thumb through the center to make a hole and dropping them into the oil. With a long-handled skimmer, Remedios turned the buñuelos in the bubbling oil and, once golden, skimmed them out to drain on a tray. She scooped them into cones of coarse paper to hand to waiting public. Combine the yeast, sugar and warm water in a mixing bowl. Stir. Let set until the yeast begins to bubble, 5 minutes. Add the olive oil and salt. Begin stirring in the flour, adding 4 cups. Turn the dough out onto a floured board and knead the dough for at least 5 minutes, adding the additional flour as needed to make a soft dough which doesn’t stick to the board. Gather the dough into a ball. Oil a bowl, put the ball of dough into it, then turn the dough so it is coated on all sides with oil. Cover with a damp cloth and put it in a warm, draft-free place to rise until doubled in bulk, about 2 hours. Punch down the dough. With lightly oiled hands, divide the dough into balls about the size of a walnut and place them on an oiled sheet. Heat the oil in a deep skillet to a depth of at least 1 1/2 inches. 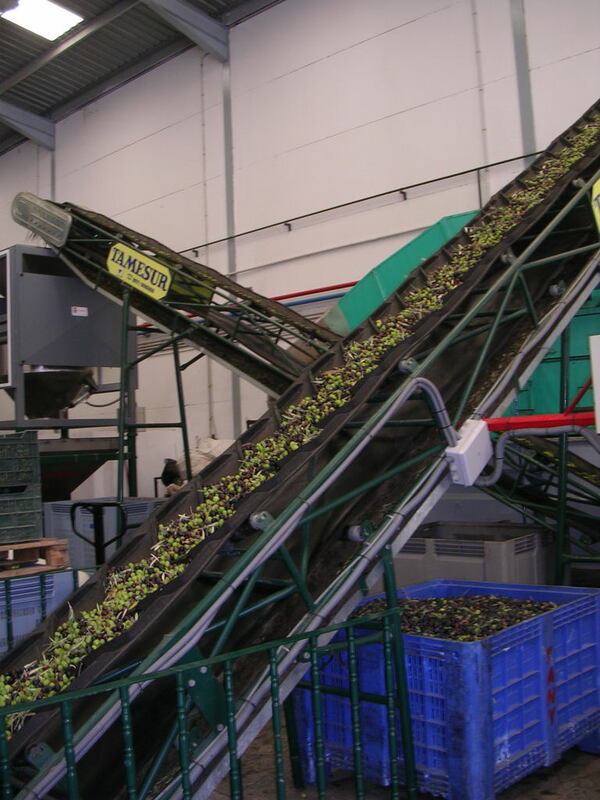 Heat olive oil to 355º; vegetable oil to 370º. With lightly oiled hands, flatten a ball of dough into a patty, put a thumb through the center to make a hole and place it in the hot oil. 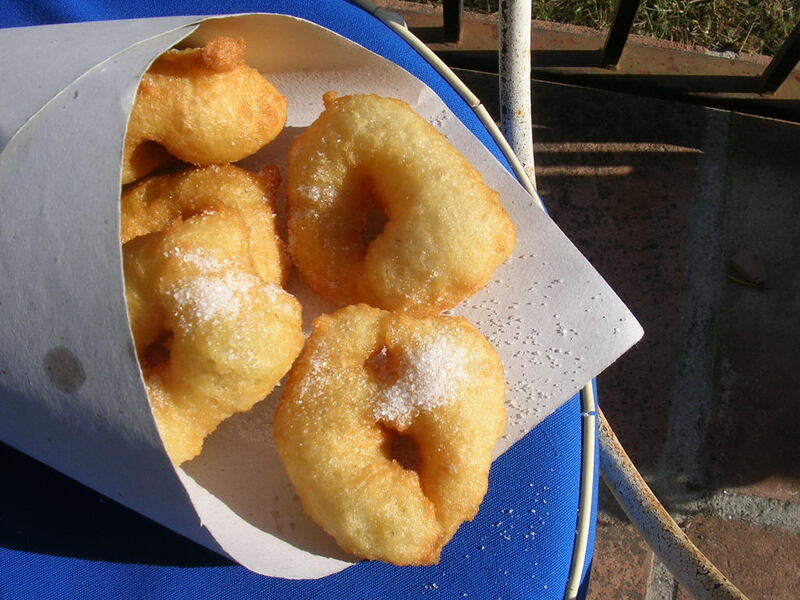 Continue shaping and frying the doughnuts, frying three or four at a time. Turn the crullers in the oil. Remove them when they are puffed and golden-brown on both sides. Drain briefly on paper towelling. Have ready a shallow tray with the sugar. While crullers are still hot, dredge them in the sugar. They are best eaten when freshly made, as they do not keep well.